This year marks the centennial for a venerable institution which has conducted a grocery store business in Tredyffrin and Easttown townships since at least the 1920s. American Stores Company, the parent of Acme Markets, was formed in 1917 with the merger of five Philadelphia chain store businesses, but it traces its beginnings back to a single store, opened in 1891 by one of its predecessors, Robinson & Crawford. While many grocery stores over the years have supplied area housewives with foodstuffs, no other single retail chain has earned such a franchise of loyal customer support. Acme has become synonomous with food store in this area, although the pronunciation of the name has frequently become "a-ka-me" in the local dialect, not withstanding Webster's failure to note this as an accepted variation. Six young men, five frugal, hardy Scotch-Irish from the north of Ireland and one from Britain's Midlands on the wrong side of the Irish sea, arrived in Philadelphia in the 1880s as the tide of immigration from Europe washed over all the eastern United States. It was a time of rapid industrialization as the economy, fueled by science and invention, shifted from agriculture to manufacturing and commerce. The business these six men knew was the grocery trade. They had worked as apprentices in old country stores. In fact, three of them, at one time or another, had served their apprenticeships with the same grocer in one County Antrim community. From this common background each man worked and saved with one ambition -- to operate his own grocery store in Philadelphia. The vast area of Penn's "city of homes", with solid rows of houses covering block after block in the gridiron of regularly spaced streets, was a fertile area for the budding entrepreneurs. It was an era when literally almost every street corner had its grocery store, only a few steps from the kitchen ranges of its inhabitants. Families depended on the corner grocer in a world where neither the automobile nor rapid transit was available to whisk them to a more distant store. Robert H. Crawford had preceded his friend Samuel Robinson in making the long voyage from Ireland. Robinson, born in Ballymoney, North Ireland, left the "auld sod" on April 28, 1888 and, arriving in Philadelphia, was met by Crawford, who had arranged for a job for his friend as a grocery clerk. The two Irishmen worked and saved, and in early 1891, as partners, Robinson & Crawford opened their first store at Second and Fernon streets in South Philadelphia (now 1214 South Second Street). Contrary to the practice of the day, they sold for cash, stressed quality, and practiced courtesy. They were ready to expand two years later when James K. Robinson, Samuel's brother, came from Ireland to buy into the partnership. He was followed by another brother, William M. M. Robinson. By then "The House That Quality Built", as Robinson & Crawford had named their enterprise, had opened three stores. The two founding partners each managed a store, and James Robinson ran the third one. The firm continued to grow at the rate of a store a year for most of its first decade. At about the same time, three other young Irishmen with ambitions as grocers -- Thomas P. Hunter, James Bell, and George M. Dunlap -- had also opened stores in Philadelphia. Capital accumulation had been difficult for immigrants who started out working for four or five dollars a week. Two of them, in fact, had failed in their initial venture as storekeepers but found backing for a second try, in which they had success. Although none of them had set out to operate a large number of stores, the potential of the chain store together with the then-existing city environment produced the formula for success. With success came modest expansion, which led to bulk purchases in larger quantities from the wholesalers. Costs came down, and gave a competitive advantage that could be passed on to customers in the form of lower prices. The first attempt at multiple store operation ran headlong into the Panic of 1893, brought on by agricultural depression, over-optimistic expansion of both industry and the railroads, and the silver policy of the government. But as the economy recovered and business and competition grew, by the turn of the century the chain store concept was firmly established and communities came to depend on the new, standardized, low-cost versions of the old neighborhood grocery store. The pace of store openings quickened, and by 1913 five rival chains were operating a total of some 700 stores. It is estimated that nearly a sixth of the 5,300 grocery stores in Philadelphia at the beginning of the First World War were chain stores. The share soon grew to one-fifth of the total, and the chains clearly dominated the grocery business in the area. In 1917 the Acme Tea Company, founded by Hunter, was the largest of these chains, with 433 stores. The S. C. [Canning] Childs Company (Childs was from Britain) had grown to 268 stores; the James Bell Company to 214; Robinson & Crawford had 186 stores; and the George M. Dunlap Company, 122. America was about to go to war and food prices were soaring. The founders of two of these grocery chains had recently died -- Thomas Hunter in 1915 and James Bell the following year -- and S. C. Childs was anxious to retire. The time had come to combine. The five chains had proved the worth of the grocery chain idea while competing among themselves, but they had only sampled its potential. The new organization brought 1,223 grocery stores under one corporate management. The combined sales of the new organization totalled close to $50 million a year. The former partners in Robinson & Crawford were given the leading role in its management, with Samuel Robinson the president and Robert H. Crawford vice-president in charge of buying. William M.M. Robinson was named the treasurer. James K. Robinson was elected a vice president in 1920. The new company succeeded from the start. Its freedom from debt was undoubtedly a factor. But more importantly, the men who had pioneered the chain grocery business, and with great success, were in charge of the corporation. The first order of business was sorting out and closing redundant stores, as in the years of rapid growth the competitors had located as many as three stores on the four street corners of some Philadelphia neighborhoods. The changes came gradually and through a prolonged shake down asthe new management phased out duplicating locations, consolidated warehouse facilities, and blended five systems of accounting into one. The reassignment of personnel, as surplus facilities were eliminated, was accomplished without lay-offs or discharges. "There need be no fear on the part of employees of this present company," Samuel Robinson announced, "that they are in any danger of losing their positions through the consolidation, as it will be the policy of the company to continue increasing the number of stores and extending the territory, which will mean the need for an even greater number of employees than at present." The promise was kept, and while the new company closed almost a quarter of the 1,223 stores it began with, by 1920 the number had grown back to 1,243 stores. Clara Warner, writing in the October 1970 issue of the Tredyffrin Easttown History Club Quarterly [Vol. XV, No. 4], tells us that one of these stores in the early 1920s was located in Berwyn, on the eastern portion of the property at the southeast corner of Lancaster and Bridge avenues. (Until recently there was an Arco gasoline station and AM-PM Mini-Market there. )Warner wrote, "To get in you went up six or seven steps. Austin Burns was the manager and was assisted [as cashier] by Miss Rebecca Derrickson. "She also noted "a funny incident": "Austin," she reported, "was alone in the store when it was opened [and] until nine o'clock and remembered that his wife wanted him to bring home some prunes. He put the prunes in a paper bag and the money that he had taken in that day in another one. He started home . .. [and] a man ran out of the drive and hit Austin on the head with a rock, knocking him down. The thief grabbed a bag and ran. Austin wasn't hurt too badly. The thief ran off with the prunes." The merger provided a rare opportunity for transferring to the new enterprise the best of the management practices of each of the constituents. The bright yellow paint that T. P. Hunter had chosen for the outside of the Acme stores was adopted by American Stores Company, which soon became known as Asco. Asco's conspicuous color identification replaced the dark trim the other chains had favored, brightening the old stores when the time came to give them a new coat of paint, and was used on the new stores as they opened. A decision to set up a fresh meat division within the company was the initial step toward what today is termed "one-stop" shopping convenience. Both Childs and Bell had developed meat operations, and American Stores adapted this program and their expertise to all stores large enough to house a cold room and meat counter. Acme Tea executive, the story goes, out for a ride in what was one of the earliest automobiles in Philadelphia, came to a stop in front of a sign post. "I like the sound of that name, Louella," he said, "We'll use it for our butter." He named the Acme Tea Company bread in the same way, appropriating the name from a Victor Talking Machine Company sign in Camden. In his history of American Stores Company, published for its 75th anniversary, Arnold Nicholson supplies some interesting sidelights on the company's butter. 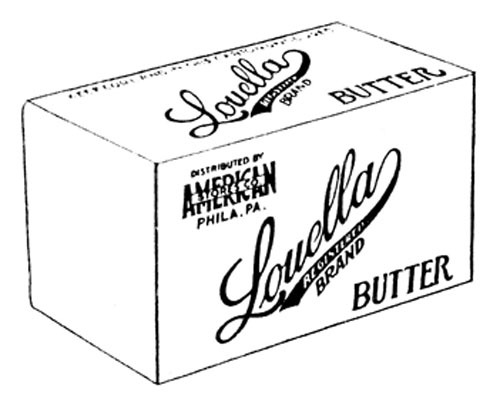 "Louella butter," he wrote, "until World War I, was churned from sour cream, like all the popular butters. Sour-cream butter quickly spoiled, and the Navy during the war determined to perfect the sweet cream process. American Stores was drawn into the picture by a contract to package two and one-half million pounds in vacuum cans for use on fighting ships. After the war the suggestion was made to put the new sweet-cream butter on the retail market. The idea appealed to President Robinson, and Louella was on the road to fame. ... American field men made arrangements, at the beginning, with 80 little creameries in Wisconsin and Iowa to meet the requirements and to pool their shipments to Philadelphia ... Louella butter began to win awards at fairs and exhibitions, and was as famous with the producers as with the Asco customers. A lot of little girls were named Louella in Iowa and Wisconsin in the twenties and thirties, recalled the then Asco butter buyer." Samuel Robinson proved to be the right man at the right time for American Stores Company. A corporation is a ward of the state which creates it, but it also takes on a life of its own. It projects a distinct personality just as surely as any child of natural parents. Robinson molded Asco as an upright, moral entity -- an extension of his own personal ethical code. Nicholson described Robinson as "tall and slender, quick to size up a situation and those about him, but almost difficult in his reserve. He preferred to listen while others talked." Samuel Robinson was a deeply religious man (as was his associate, Robert Crawford). A Bible that his mother had inscribed, "To Samuel Robinson with a mother's blessing -- Proverbs 3:5-6", was kept in his desk and read every morning during his business career. He insisted on sharing with his employees his belief that the Scriptures were a sure guide to a successful life. One of Robinson's regular tasks was his monthly contribution to The Trumpeter, the American Stores employee publication. His messages were always inspirational and began with a biblical quotation. The principles that Robinson laid down for American Stores were demanding. was a slogan he continually drummed into all his employees. This message was not only repeated, year after year, in his communications in The Trumpeter, but the president also saw to it that copies were posted in the rear of all stores, in offices, and in warehouses. Employees might grumble about the "preachment", but Robinson's widely aired principles also won their respect. There was no question about the integrity of the company to which they belonged. Success brought an opportunity for the founders of American Stores Company to pause and reflect on their roots in the countryside of Northern Ireland. A passion for horses gripped these men, an affinity no doubt forged in days spent working with a team. Horses then represented power, mobility, and status, as the automobile does today. Pastures and paddocks in the rolling hills of Chester County were reminiscent of the green valleys winding to the Irish Sea. William M.M. Robinson chose a location astride the western border of Easttown Township to establish his estate. He purchased Nawbeek Farm, at South Valley and White Horse roads south of Paoli, in November 1928 from Sara White Coxe, widow of the renowned breeder of trotting horses, Alexander Brown Coxe, who had carried on his operations there for almost thirty years prior to his death in 1926. The original tract of land consisted of 335 acres, all but five acres in Willistown Township. Later the Willistown acreage was increased to 392 acres, and in November 1932 he purchased an adjoining farm of 152 acres, known as Westwood Farm, at Darby and Grubbs Millroads in Easttown Township, from John McPhillips. All told, Robinson assembled about 550 acres of local land for his estate. Robinson specialized in five-gaited horses, which were shown at the Devon Horse Show and throughout the country. Ellen Campbell, a one-time Paoli resident who worked with him, says of Robinson, "He was a very pleasant, capable person who loved the farm and horses." Mary Ives, too, remembers fondly his wit, expressed while commuting with her to Philadelphia on the Paoli Local in the 1940s. In 1946 he retired as vice-president and treasurer of American Stores, to the farm. He died in January 1950. James K. Robinson, William's brother, also was attracted to Chester County. The percherons and saddle horses from Crebilly Farm, which he established just south of West Chester in 1935, were widely known. In 1946 he purchased Beau Fortune, a five-gaited champion stallion owned by R. A. Rettler of Republic Steel Corporation in Chicago, for a record price of $50,000. He also was active in the Devon Horse Show for many years, and his son, James K. Jr., continues to operate Crebilly Farm today. James K. Robinson retired as vice-president and general manager of American Stores in 1948, and died in February the following year. Samuel Robinson, while never a breeder of horses, maintained stables at his home, Glencoe House, in Rosement, and, until he reached the age of 80, began each day with a canter on his favorite mare. The 1920s saw a doubling in the number of stores operated by the company. By 1930 the store count had climbed to 2,728, and there were 13,000 employees. Contributing to this rapid expansion was the acquisition of other chains in outlying areas far from the Philadelphia base as geographical expansion accounted for at least a third of the gains. The 1920s were also a time of change and social ferment. The prohibition and women's suffrage amendments had added new dimension to everyday life. The automobile gave mobility to shoppers not enjoyed before. The war had changed styles and fashions, and molded consumer demand into new channels-- in little ways, such as the introduction of wrist watches for men, shorter skirts for women, and cigarettes for both, and in major ways, as the automobile, that forever changed the way America traveled. Change was also due in the grocery business. On March 21, 1929 the Marketeria opened at 69th Street, the initial experiment of American Stores, with a large self-service market -- "large" when compared with a store twenty feet wide and eighty feet deep or 1600 square feet, about average for the time, and "self-service" in contrast with the then-existing store where a man behind the counter selected the customer's order. The Marketeria was a true "one-stop" food store, where groceries, meat, and fresh produce were available. Customers entered through turnstiles and the only exit was at the check-out counter. A small wire basket, carried on the arm, was supplied each customer to hold her purchases. Automobile parking was also provided at the Marketeria, but not immediately adjacent to the store. All of the physical ingredients of a supermarket were present, with one notable exception -- the shopping cart. Sales, however, were complicated by giving each customer, as she entered, a card on which each purchase had to be indicated. The idea of turning a woman loose, unattended, to help herself from the shelves appalled grocers who had spent their lives guarding their merchandise from petty theft! This mistaken caution destroyed the magic sales ingredient that later supermarkets supplied. It also required an unneccesary number of clerks. Nevertheless, the Marketeria returned a profit, until the owner of the building in which it was located sharply increased the rent and the store was closed. In addition to its Marketeria experiment, American Stores was also involved in 1929 in what was a major landmark in shopping center development. In that year Suburban Square opened in Ardmore; it was one of the first modern shopping centers in the nation. Two years after the center opened Asco built a combined grocery and meat store there, which served as a model store for the chain. American Stores Company stock was first listed for trading on the New York Stock Exchange on April 25, 1929. Within a few months the stock market collapse of October 1929 ended the Coolidge boom and plunged the nation into depression. The company was forced to cut wages, but no employees lost their jobs through the period of the bank closings, followed by the NRA and Blue Eagle. Robinson guided Asco through the storm, and, in fact, aided by additional acquisitions in Baltimore and western Pennsylvania, the number of stores reached an all-time high of 2,977 in 1932. At this time William Park, the man who would succeed Samuel Robinson as president of the company, was deeply involved in affairs of management. He was a nephew of Samuel Robinson, whose sister had married Robert Park, who had migrated from Ireland to Michigan, where he established a butter, cheese and egg business. The Parks were a major source for Asco's Gold Seal eggs, until the industrialization of southern Michigan replaced many farms and the Park's business came to an end. Prior to the First World War William Park had come to Philadelphia from his father's farm in Caro, Michigan, and his food industry career began as dairy products buyer for Robinson & Crawford in 1912. After serving in World War I he returned to become manager for the procurement of all perishable foods for American Stores. In 1920 he became a director of the company and assistant to the president. He was destined to lead the company through difficult years of changes. One of the men who knew him well described him as "a quiet entrepreneur". He was every bit as devout a Scotch-Irish Presbyterian as Samuel Robinson, but not inclined to proclaim it to his co-workers. He preferred to stay in the background, managing with a firm hand and voicing decisions only after all the facts were in. Park's term as president began in 1937 when Samuel Robinson retired. An immediate and vexing problem was the then popular feeling that chain stores should be curbed. In Pennsylvania in 1936, a tax which grew progressively with the number of stores operated by a corporation was enacted. The company had 1,743 stores in Pennsylvania, and the chain store tax added $750,000 to the company's operating expenses in 1937. The tax thus hastened the closing of less profitable stores before the State Supreme Court invalidated it in 1939. Other forces were also at work leading to a steady decline in the number of stores down to 2,130 by 1941. Women had shown their preference for the convenience of one-stop shopping, and the automobile had created a mobility which alowed easier travel. Now they were turning to self-service markets that were three, four, or five times as large as the traditional store and doing ten times the amount of business. The invention of the shopping cart in 1937 gave the final ingredient needed to ensure the success of the new type of self-service store. The era of the supermarket had arrived. It was Paul Cupp, then head of the North Jersey zone, who was assigned responsibility for opening the first two company supermarkets, in Paterson, New Jersey, in 1937. The stores were an immediate success, and the decision was made to call the new stores Acme, after the old Acme Tea stores, to distinguish them from the usual Asco grocery and combination stores. As the new president, Park was beset with three thorny problems in redirecting his company: guiding the transition from corner stores to supermarkets; addressing personnel concerns (a strike by butchers and clerks in 1940 closed the stores for a month and led to unionization); and finding capable people to staff the stores during the World War II years when more than 40% of the employees served in the armed forces. At the same time, gasoline rationing slowed significantly the trend toward supermarkets. Nevertheless, the company had established 576 Acmes by 1942. First generation supermarkets were opened at 2-4 West Lancaster Avenue in Berwyn on May 5, 1939; at 154-156 East Lancaster Avenue in Wayne on October 27, 1939; and at 3-5 West Lancaster Avenue in Paoli on November 10 of the same year. After the settlement of the butchers' strike in 1941 a new six-day, 48- hour week was established -- with no cut in wages from the previous pay that had been based on 58 hours' work. Between 1941 and 1946 American Stores also became one of the industry pioneers in establishing a pension plan and providing life, health and accident insurance coverage for all employees. In time, hospitalization and other fringe benefits were also added to the program. The company was fortunate in one respect during the war. During gasoline rationing it still had hundreds of little neighborhood groceries which were within easy walking distance of the homes they served. But the days of the little Asco counter-service groceries were numbered. The 1,288 stores in 1944 shrank to 857 in 1948, and were down to 223 in 1955. The last dozen, kept open only in special neighborhood situations, were finally closed during the 1960s. Park's program for the company included a build-up of company brands in which quality was the key factor. He believed that company control or ownership of processing plants could assure quality, and had economic advantages as well. Louella butter was a prime example. The company adopted the brand name Ideal for most of its first-line canned goods, after it obtained the name in a 1941 acquistion of another chain. A key factor in the post-war supermarket development was the adoption of the frozen foods technology perfected to preserve foods during the war. The armed forces used frozen foods in tremendous quantities, and when they were removed from the ration list in 1944, a stampede began. As zero refrigeration in stores was essential to the boom in frozen foods, furnishing the elaborate equipment needed, including frozen food cases, placed added demands on the company's engineering department. A fundamental change in the real estate operations of the company also began with the supermarket age. The new and costly markets were built by the company and either owned outright or held under long-term lease-back agreements. Site location was a complex affair, with a final decision reached only after exhaustive market studies, field inspection trips, and deliberation by a committee appraising the financial aspects and availability of funds. What proved to be one of the most important real estate location decisions in the history of American Stores took place at about this time. In 1954 the company was looking for a suitable location for a shopping center that would include an Acme as one of the major stores. It was fortunate to find substantial acreage comprising the Maple Croft Farm of William C. Wilson. On this acreage rose what today is the King of Prussia Plaza, one of the largest shopping centers in the nation. The Acme opened thereon September 18, 1962. The increased size and expensive refrigeration and frozen food equipment boosted the price tag on the new second generation Acme supermarkets to upwards of a million dollars, including merchandise inventory, a far cry from the cost of the old corner Asco groceries. Mistakes in selecting locations for supermarkets obviously became very expensive indeed. The new generation of supermarkets arrived on the Upper Main Line around 1950. In Wayne a flagship store opened just west of the Anthony Wayne Theatre at 127 West Lancaster Avenue on November 2, 1949, and two smaller stores were closed; the 1939 supermarket referred to earlier, and a grocery at 129-131 North Wayne Avenue. An Asco grocery in the Harley Building on the north side of Lancaster Avenue in Devon, opposite the Horse Show grounds, closed about a year later. A new supermarket in Berwyn, on the site of the old Easttown Grammar School, on the lot on the south side of Lancaster Avenue between Bridge and Central avenues, opened May 21, 1952. 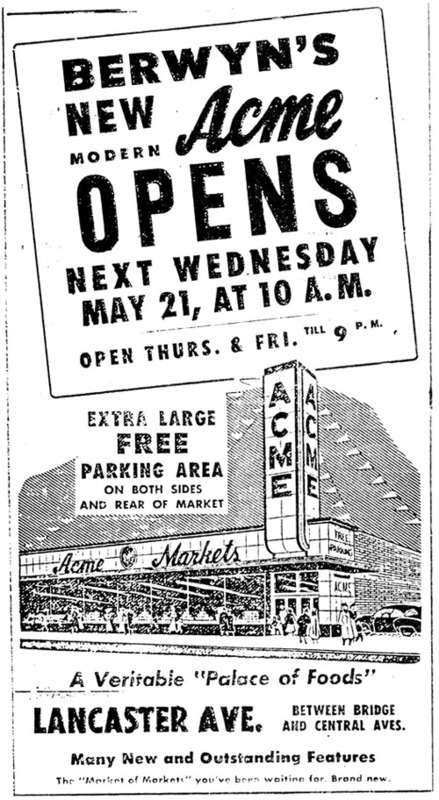 An advertisement in the Upper Main Line News at the time of its opening described the new Acme as "a	veritable 'Palace of Foods'", and as "The 'Market of Markets' you've been waiting for". The old 1939 store at the southwest corner of Lancaster and Main streets (later occupied by Harold's, a dry goods store operated by Lou Lieberman) was closed, followed by the closing of the Asco store at 8 East King Street in Malvern at the end of the year. 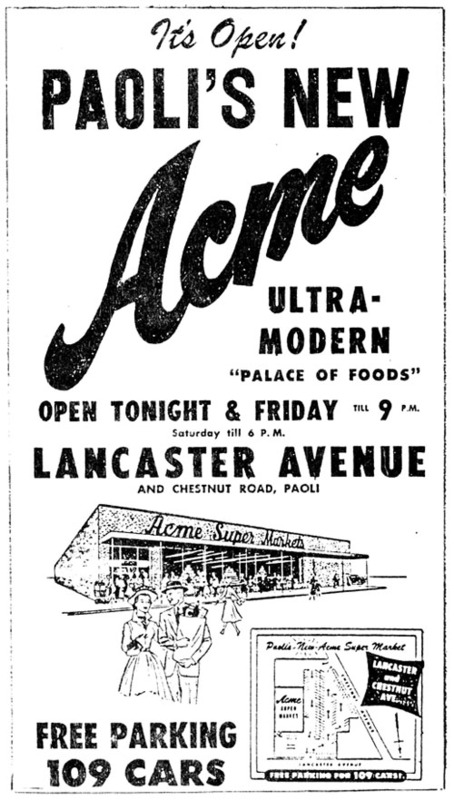 In Paoli a new "ultra-modern" Acme, with parking for 109 cars, opened in the Paoli Shopping Center on August 25, 1954, and the 1939 store west of the Wedge Building on the north side of Lancaster Avenue was closed. The new development along Lancaster Avenue during this half decade, with the opening of three new stores, while six older, smaller stores closed, represents a good cross-section of what was happening within the company. By 1960 the store count had dropped to below 800 as the newer larger markets became the mainstay of company operations. In recognition of the increasing importance of the Acme supermarkets, the name of the company was officially changed from American Stores Company to Acme Markets, Inc. on June 2, 1962. The growth of the company during Park's presidency in the 1940s and 1950s is reflected in the increases in average weekly store sales. The average weekly sale was $2,900 in 1946, a year in which total sales reached $307 million. Five years later weekly store sales averaged $5,600, with the overall sales figure $461 million. By 1955, the year Park was succeeded by Paul Cupp as president, average store sales were $10,600 weekly and the total sales that year exceeded $611 million. Cupp had great enthusiasm for and understanding of supermarket operations, born of his pioneer development work on Acme supermarkets. He took office prepared to play the servant's role, selling company policies to those who worked for him -- a humble and effective approach. Nicholson says that "his approach to company problems was direct and thorough -- in many ways reminiscent of the calculating decisiveness Samuel Robinson had employed". Under Cupp's leadership, the company continued to grow. In the late 1950s American Stores was opening an average of one new Acme a week. When a competitor began offering trading stamps to customers in 1955 as a sales incentive, Cupp signed up with Sperry & Hutchinson Company, the undisputed leader in the field, to obtain the popular S&H green stamps for American Stores customers. Response was immediate and dramatic, as sales soared in 1956, buoyed also by one of two post-war acquisitions in New York state. Negotiations for what was by far the most important acquisition for American Stores took place during the fall of 1960, when Cupp engineered a combination with the southern California chain of Alpha Beta Food Markets, Inc. The merger took place on January 16, 1961 when Alpha Beta became a wholly owned subsidiary of American Stores Company. With the merger, the growth of the company now shifted west, where the new subsidiary rode the crest of the California population boom and ultimately eclipsed the potential of its parent in the east. A company investment outside the grocery field, made in 1964, initiated a program of diversification. Rea and Derick, Inc., operator of a chain of forty drug stores in central Pennsylvania, became part of Acme Markets in what was its first large venture into the drug store field. Following William Park's death in 1961 Cupp became both president and chairman of the Board. He held the latter position for 13 years, until he was 72. During this period, in 1968, Acme hit the $1 billion mark in annual sales for the first time. In addition to his accomplishments with Acme, Cupp showed a prodigious appetite for civic causes. He embraced civic and church activities with the same persistent vigor that he showed in company management. At the time of his death, August 15, 1988, he was eulogized by a colleague as "one of the old breed of Philadelphia civic leaders". He was very dedicated and gave a great deal of himself to the community, taking a leadership role in numerous city institutions, among them the Presbyterian-University of Pennsylvania Medical Center, the YMCA, and the United Way. Another associate recalled that he was a very inspiring leader. It was clear that his faith was a strong motivating force in his business life and in everything he undertook. John R. Park became the company's fourth president in 1965, succeeding Paul Cupp, and added the title chief executive officer two years later, when the latter stepped aside. A nephew of William Park, he was also a native of Caro, Michigan. He joined the company in 1939, working first in the old Johnstown zone. In October 1942 he entered the U. S. Navy as a supply officer, and when he was discharged in 1946 he returned to the company in the treasurer's office. He was elected treasurer in 1949, vice-president in 1953, and executive vice-president in 1958. In 1951 he also became a director of the company. Every bit a gentleman, John Park was a man of great sensitivity who cared greatly for his employees. Decisions were difficult for him, and were made only after all the facts were known. He was analytical, but often agonized over a decision when he knew he was taking the unpopular side of an issue. Although not a scheduled work day, Saturday morning became a special time for coming to grips with issues, checking sales progress, and reflection, and it was expected that members of his staff would also be available at their desks for consultation if needed. The early years of his presidency were marked by rampant inflation, precipitated by the Vietnam War. In addition, competitive pressures were particularly intense, as Penn Fruit, Pantry Pride (Food Fair) and A & P were all trying to carve out a larger slice of the marketplace pie. At the same time, green stamps, although loved by the customers, carried a cost burden that was beginning to impose a restraint on Acme's ability to counter competitive forays. The retail food business is a highly competitive one, and the convergence of these many factors led to the introduction of a new discount type of food store format, designated as the Super Saver. Introduced first in northern New Jersey, Super Saver stores were designed to serve a larger selling area, and each was located where density of population and road patterns were such that a large number of families could be served. Lower prices were possible because of the reduced cost of doing business (including reduced promotional costs as trading stamps were eliminated). The company had opened about 40 Super Saver markets by the beginning of 1972, at which time it was decided to drop trading stamps in nearly all Acme food stores and institute the discount type operation broadly. The program was successful in stimulating new growth in Acme; by 1974 its annual sales volume was over $1.5 billion. Subsequently both Super Saver and Acme stores used the same marketing program, and the name Super Saver was phased out as all the stores were again known as Acme markets. Park also saw the wisdom of broadening lines of merchandise, moving from handling food only into also meeting the consumable non-food and household needs of customers. He also recognized that the growing popularity of fast foods was taking place at the expense of food sold in supermarkets, and in 1969 Acme entered the fast-food franchise field when it made an agreement with Hardee's to act as its franchise agent in Acme's eastern operating territory. Over 30 units were opened, some owned and others franchised, during the 1970s. The transition from the once adequate mid-sized supermarkets to the new ever-larger one-stop markets, with heavy emphasis on general merchandise and specialty departments, continued during the John Park years. The Acme in Berwyn moved east along Lancaster Avenue to a location in the new Berwyn Shopping Center at the eastern edge of the village, where a 21,000 square foot supermarket was opened on November 20, 1966. Similarly, in Wayne a new Acme opened in a company-owned shopping center at 311-315 East Lancaster Avenue on February 4, 1970 and the store west of the theatre was closed. The heavy load of capital expenditures for new stores and support facilities, both in the East and in California, required the company eventually to resort to borrowing. In August 1970 Acme Markets sold publicly a $25 million debenture issue. This was the first public debt offering in its 80-year history. The borrowing, along with a second $50 million debenture issue in July 1976, enabled the company to repay substantially all its short-term bank debt and materially strengthened its working capital position. The use of data processing and computerized management information services was also begun and rapidly expanded, with a new financial data reporting system, known as Operations Information Systems, implemented near the end of 1971. Another innovation at that time was a "fast response" system for store stock replenishment, encompassing store terminals, telecommunications, and a unique automatic polling system. Because of the company's rapid growth and expansion during the late 1960s and early 1970s a need arose for a more functional management organization. Accordingly, Park directed a corporate restructuring, in which the corporate name was changed back to American Stores Company. On December 29, 1973 this company became a holding company based in Wilmington, Delaware, with Acme Markets, with responsibility for the operation of the eastern supermarkets, organized as a Pennsylvania corporation, a wholly owned subsidiary of American Stores Company. Named president of the new Acme organization, as of January 1, 1974, was Peter F. McGoldrick, formerly a group vice-president of Jewel Food Stores, a Chicago area food chain. During his 18-year career with Jewel he had held positions in buying, advertising, sales promotion, merchandising and operations. A native of Boston, Massachusetts, he was a dynamic, urbane, warm-hearted but mercurial Irishman. He was a friend to all his employees, but, if crossed, displayed a sharp temper. McGoldrick led Acme to new heights as sales increased to an annual rate of over $2.2 billion in 1980, the year he resigned. He successfully completed the difficult task of building a new Acme organization following the departure of many key individuals to the holding company and the retirement of other long-service members of top management. It was during this period that Acme secured more than a dozen prime locations at the auction of the bankrupt Food Fair properties in 1978 and 1979. These locations, mostly in the Philadelphia area, were all of large size and almost without exception have proved to be key ingredients of Acme's success in the decade of the 1980s. One of these stores was located on Lancaster Avenue in Devon, a former Pantry Pride store. It reopened as an Acme, after extensive renovations, on August 24, 1980. Following the corporate restructuring, at the end of 1973 Acme's parent, American Stores Company, moved into offices in the Rollins Plaza Building on Route 202 north of Wilmington. Under the holding company concept envisioned by John Park the parent company and its staff provided for the subsidiaries services such as real estate planning and research, financial planning and forecasting, capital allocation, engineering and facility planning, insurance and employee benefits, accounting and taxes, legal matters, federal governmental relations, management development, and general policy formulation and coordination, as well as handling relations with shareholders and appropriate legal and financial responsibilities of the parent company. With Paul Cupp's retirement from the Board in 1974 Park also assumed the duties of chairman. William Radcliffe Deeley arrived at the Rollins Plaza offices in 1976 as the fifth president of American Stores, succeeding John Park, effective August 1. Before this post he had been president and chief executive officer of Alpha Beta during the previous seven years, the period of its greatest growth and expansion. He was born in Mount Vernon, Ohio, and served in the U. S. Army before resigning his commission in 1957 to start his career with Alpha Beta, rising through several important executive positions to its presidency. He was meticulous, methodical and a firm believer in standard operating procedures. In 1977 he was elected to serve also as the chief executive officer, with John Park retaining the position of chairman of the Board. As John Park approached retirement in 1978 he had positioned the company with a strong, young management team. But in January 1979 the daily number of shares of American Stores stock traded on the New York Stock Exchange began to climb far above its norm. An uneasiness gripped the corporate suite at Rollins Plaza. It was not long until the buyer of the shares identified himself --L. S. "Sam" Skaggs, owner of Skaggs Companies, Inc., with headquarters in Salt Lake City, Utah. To avoid a protracted and costly proxy fight for control of the company, the American Stores executives capitulated. On March 14, 1979 a joint press release by the companies announced that "Skaggs and American Stores have entered into, and the Boards of Directors of both companies have unaminously approved, an agreement in principle providing for the combination of the two companies. ... The surviving company," it was also announced, "will operate as a holding company to be headquartered in Wilmington, Delaware. The name will be changed from Skaggs to American Stores Company." A sudden wholesale closing of Acme operations in western Pennsylvania (the Johnstown division) and in New York (the Syracuse and Buffalo division) took place between the merger announcement and its consummation. Since the Acme stores in the two divisions had been marginally profitable and no closings were imminent, it is assumed that these 75 stores and three warehouses were weeded out at the direction of the Skaggs interests. John Park retired effective with the merger, at the end of July 1979, and Deeley was named president and chief executive officer of the new enterprise, with Skaggs named chairman of the Board. In the first annual report to the share holders following the merger, it was stated, "The two merger partners are both substantial presences in retailing. The old American Stores Company was one of the country's leading food chains with a history dating back 89 years. Its primary involvement was on the East Coast and California. The first Skaggs store opened 40 years ago, and Skaggs was known as the nation's third largest drug chain and as an operator of large combination grocery/drug stores. Skaggs Companies operates in 21 states, primarily in the West, Southwest and Midwest. We believe that together these two well established companies, with their complementary resources, are stronger than each would have been alone." A few paragraphs later came a statement of the future direction of the merged companies; "The major part of the store opening program," it was stated, "will [now] be concentrated in the 'Sun Belt1 states, which generally possess vigorous economies and growing populations." In February 1980 it was announced that the headquarters of the new American Stores would be relocated to Salt Lake City, though the headquarters for the Acme Markets subsidiary remained in Philadelphia, with Deeley staying in the East as vice-chairman, relinquishing the duties of president and chief executive officer to Skaggs. The American Stores Company which had sprung to life in Philadelphia as America entered World War I had ceased to exist, but for Acme Markets it was business as usual, though with a new parent company located west of the Rockies. For those born and bred in Philadelphia, the last decade of the first century of Acme's existence proved to be a bittersweet experience. There was still a poignant fondness for "the old days", and a feeling of nostalgia for men of the likes of the Robinsons or the Parks. But in the marketplace there was still business to be done, and no time to reflect on what was done or what might have been. In mid-July 1980 Peter F. McGoldrick resigned as president of Acme Markets. Thomas W. King, age 49, an executive vice-president of Alpha Beta, was named president and chief executive officer, as of July 15. King was a native of southern California and began his career with Alpha Beta as a bag boy. He rose through the ranks to become manager of the company's meat packing plant in Huntington Beach, California. Moving to company headquarters, he managed warehousing, manufacturing, transportation, and operations activities, and advanced to the position of executive vice-president in 1976. Upon his appointment, he expressed his goals, including building a team at Acme. "I may overwork the word team, probably," he noted, "but I am a team player, not a guy who sits at the top and makes all the decisions. I feel that people who are given responsibility and allowed to do their jobs will do a good job. And I've operated on that philosophy for many years, and I'll continue to operate on it here." That was Tom King's style. It endeared him to all with whom he came in daily contact, notwithstanding the fact that one of the first challenge she had to face was improving efficiency and reducing expenses. He made hard decisions in order to reduce administrative and supervisory staff levels and streamline operations to create a leaner, more efficient Acme. At the same time, he launched a program to roll back prices on more than 3,000 items and reposition Acme as the "overall price leader" in the marketplace. The program succeeded, as evidenced by sales which increased to over $3 billion in 1985, an increase in volume that was achieved despite the closing in May 1982 of all 36 stores in the Harrisburg- Baltimore-Washington marketplace, where operating costs had escalated to a level which precluded profitable operations. The large meat packing facility in Lincoln, Nebraska was also closed in December 1982. King's contributions at Acme were recognized when he was promoted to be president and chief operating officer of the parent American Stores Company in Salt Lake City, effective February 2, 1986. Dennis K. Eck, who had come to Acme as senior vice-president for marketing in 1984, replaced King as president of Acme Markets. Eck was 42 years old when he took command at Acme. Reared in Wolf Point, Montana, he had an extensive background in both food and drug retailing. He started his retail career with Buttrey Food Stores, part of Jewel Food, in Montana in 1954 as a carry-out boy and meat wrapper. His varied experience in the Jewel chain (which was acquired by American Stores in 1984) included assignments as vice-president of marketing and divisional manager for Jewel Food Stores in Chicago and as executive vice-president of Superstores for Sav-on Drugs, Inc. in southern California. During his occupancy of the president's office Eck carried out a program of updating and modernizing the Acme store network. A total of 100 projects were completed, involving more than a third of the total stores and almost two-thirds of the company's total sales. New departments, such as salad bars, bakeries, expanded delis, hot food departments, fresh seafood, video rentals, one-hour photo labs, fragrance bars with licensed cosmeticians, floral departments, and appliance departments were incorporated into the store format, and added greatly to customer appeal. Customers responded very positively to the remodeled stores, and sales performance was significantly improved. In September 1987 Robert A. Neslund, former vice-president of operations and distribution at Jewel Food Stores, became the president of Acme Markets, replacing Eck, who had relinquished his position as president of Acme to become president of Alpha Beta Stores, Inc., the western subsidiary of American Stores Company, with headquarters in Irvine, California. Despite its store modernization program, Acme had lagged behind some industry leaders in applying scanning technology to its retail operations. The UPC bar code, a universal numerical product code accepted by the grocery food retailing industry, had been around since 1973. With the UPC bar code each item and its price can be recorded at the cash register electronically, using a mini-computer, expediting the check-out. But it was not until 1988 that Acme installed front-end scanning systems in 149 stores and upgraded its electronic cash register technology in 104 additional stores to give them scanning capability, giving greatly improved check out service to customers. In the last three years of its first century Acme has opened twelve large combination stores which bring together a complete drug store and a full line grocery store and also a broad line of general merchandise under one roof, all with one common bank of check-out counters. The concept, pioneered by Skaggs in the West, offers wide appeal and obvious convenience. The stores include a complete pharmacy department, staffed by licensed pharmacists, the first of this type to be operated by Acme Markets. One of them is located just over the North Valley Hills, in Phoenixville, and opened May 18, 1988. A milestone was also reached during the Christmas 1989 sales season when an Acme located in Philadelphia became the first store in the company's history to have weekly sales of $1 million! But disturbing news reached the new Acme headquarters late in the afternoon of September 18, 1990. A press release issued in Salt Lake City announced that the "American Stores Company . . . Board of Directors [had] authorized management to explore the sale of Acme Markets, Inc., a wholly owned subsidiary. ... While the chain is performing extremely well," it was announced, "the company believes the sale of Acme Markets would be in the long term interests of American Stores and its shareholders. The proceeds from the possible sale would be utilized to reduce debt, allowing American to focus [its] time, energy and capital resources on American Stores' food and drug assets in other profitable and growing markets." On the eve of its second century, Acme now has 275 stores, and the people of Acme, 25,000 strong, look forward with eagerness and anticipation to serving their loyal customers and friends with pride and confidence. Copyright © 2006-2009 Tredyffrin Easttown Historical Society. All rights reserved.